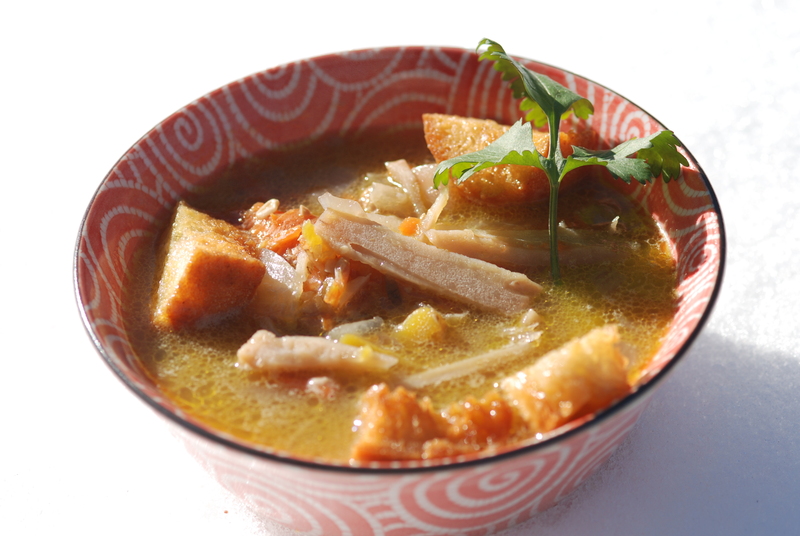 Kinpira soup is amazing for supporting your overall vitality. Add a few deep fried sourdough croutons and you will be so satisfied. Be careful as you will feel like you can conquer the world after eating this! Place a soup pot over medium heat. When the bottom of the pot is warm, add the oil followed by the burdock. Add a pinch of sea salt. Saute for about 2-3 minutes so the burdock is fully coated with oil. Spread the burdock evenly over the bottom of the pot and layer the carrots followed by the lotus root. Cover the vegetables with water, bring to a boil, then lower the heat, cover, and simmer for 45-60 minutes. You may need to add water from time to time. After 45-60 minutes, add the onion and squash. If additional water is needed, feel free to add (bring back to a simmer after adding water). Simmer for 20 minutes. Place the barley and sweet miso in a small bowl, scoop out a few tablespoons of broth, and mix in with the miso to dilute it. Slowly add the diluted miso mix to the pot and stir gently. Simmer for an additional 5 minutes. If using ginger, grate fresh ginger and squeeze ginger juice to taste. For optional sourdough crouton topping, bring sunflower oil to about 360F in a cast iron deep fryer (I often use a small cast iron pot when deep-frying a small amount). When oil comes to temperature, drop sourdough croutons into oil and remove when golden brown. The oil will be at the perfect temperature if the crouton drops to the bottom of the pot and then immediately rises to the top. Place croutons on top of soup. Garnish with cilantro or parsley and savor every bite.